With the tremendous increase of vehicles and the weakening effects of vehicle restrictions, traffic jams have resumed and become more serious in Beijing. Some experts advise that the local government should take more effective measures to ease the congestion. According to recent statistics published by the Beijing Traffic Management Bureau, the average number of congested roads during the morning rush hour is 30. That number is an improvement from what it was before the current policy of restricting cars on the road took effect. Before the policy was initiated, the average number of congested roads during the morning rush hour was as many as 50 to 60 roads. However, congestion has increased since the policy first started. When the policy first began in October last year, there were almost no roads classified as having congestion. The morning rush hour currently lasts from about 7 a.m. to 11 a.m. Ms. Qiu, a Beijing resident, told The Beijing News she spent almost one hour commuting to work Monday, a commute that previously took half an hour when the policy first started. Professor Mao Shoulong from Renmin University of China holds the opinion that to keep long term vehicle restrictions will cause other issues, such as people buying a second car to get around the license plate policy. Statistics from the Beijing Asian Games Village auto market, confirmed Professor Mao's prediction. It shows that since January of this year, the small-displacement car has had good sales, even to the point of not having enough cars on the lot to satisfy demand. Since April, the used car market in Beijing has increased by 50 percent. According to an employee at a used car market in Beijing, after the vehicle restriction policy, the demand of small cars worth less than 80,000 yuan increased. This is because consumers hope to bypass the vehicle restriction policy by having a second car to drive on the days when their original car is prohibited from being on the roads. 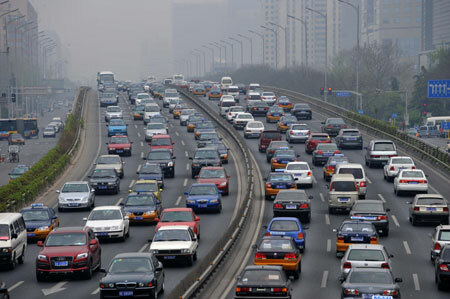 Professor Rong Jian from Beijing University of Technology told The Beijing News, "The number of automobiles in Beijing is more than three million. The driving restriction takes 700,000 cars off the roads each weekday. However, with the natural growth in number of cars, the effects of vehicle limits will diminish in three years." The latest data released by the Beijing Traffic Management Bureau shows that as of February 19 this year, there were 3.56 million cars in Beijing. It took only 13 months to go from 3 million cars to 3.56 million cars. If cars continue to increase at this pace, within three years the traffic congestion in Beijing will resume to the original degree it was before the limitation policy – that's even if Beijing continues to impose the policy. Comparing the traffic conditions in October last year to the conditions after announcing the new vehicle restrictions in April this year, the effects of the policy is weakening and the number of vehicles in Beijing continues to rise.